Note: If you are using an older version of WPML (3.1 or lower), it is recommended to upgrade. However, it is still possible to follow the instructions in the previous tutorial to create your website translation project. To register your site in ICanLocalize, you just need to follow a simple wizard. Registration will create a new translation project and each batch of contents you send for translation will be separate jobs inside that project. Go to the WPML -> Translation Management page and click the Translation services tab. Activate ICanLocalize from the list of services. Click on the Authenticate button and then on the ICanLocalize “Sign up” link. Fill in the form with the name and email address associated with your ICanLocalize account. The registration wizard will provide you with an API token. Copy the API token. 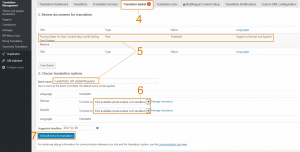 Go back to the Translation services tab on the WPML -> Translation Management page and return to the ICanLocalize authentication wizard. Paste the API token and click Submit. Note: The registration wizard and options depend on the WPML version installed. If you cannot follow the steps above, you can find your API token in the profile page after logging in to your ICanLocalize account. After completing the registration, you are ready to start. Unlike previous versions, you no longer need to add translators or check their applications anymore. 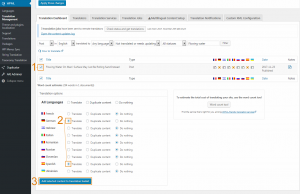 In order to select the contents you want to translate, you can return to WPML -> Translation Management-> Translation Dashboard to select pages, posts or products. Select the checkboxes of the items you want to translate. Scroll down to the Translation options section, then choose the Translate option for the desired language. Click the Add selected content to Translation Basket button. Now, click on the blinking Translation Basket tab. In the Translation Basket, you can review the items to send for translation and the languages. Optionally, you can also change the Batch name if you prefer to give it a more recognizable name. Click on the Send all items for translation button. If you need to send strings for translation (theme, plugins and widgets elements), you will need to install and activate the WPML String Translation module. You can find and select the strings to send to the Translation Basket on the WPML -> String Translations page. After sending the content for translation, you can click on the “Translation Jobs” link to view the WPML tab with the list of jobs. Just click on a batch name to be redirected to ICanLocalize, and click on the Set up pending translation jobs button to see a summary of the content sent. Automatic assignment with fixed rates: to enable this feature, select the Automatically invite best translators option. This is the default mode which will assign translators automatically and you will get a fixed rate per word. Manual assignment with application process: to enable this feature, select the Let me choose translators option. You can browse the translators’ profiles, invite them to the project and check their rates, and then assign the ones you prefer. If you decide to have translators automatically assigned, you can proceed directly with the deposit and later receive a confirmation email with a list of the assigned translators. If you select the translators manually, you will be asked for a deposit only after assigning the translators. In either case, the translators will start working as soon as there are funds in your account balance and you confirm the translations can start clicking the Pay and begin translation button. 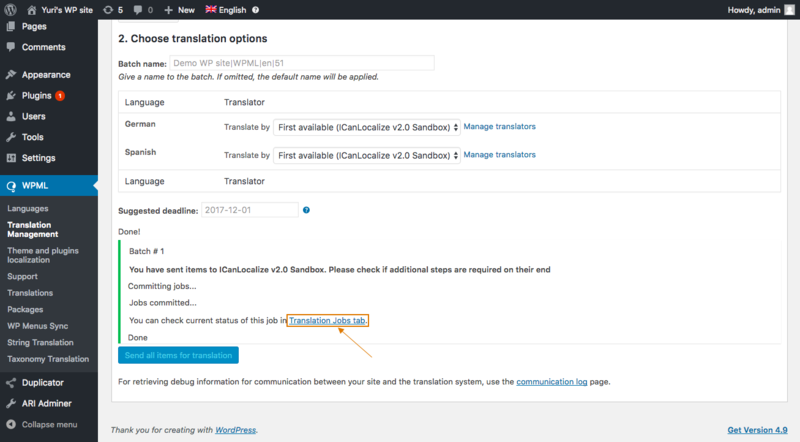 Each time you send us content for translation, you will need to go to the Pending Translation Jobs page in your ICanLocalize account and click the Pay and begin translation button to confirm the payment of all the pending jobs. If you have enough balance in your ICanLocalize account, the payment will be deducted from that balance after clicking the button. If the balance is not sufficient, you will be given several options to complete the payment. Note: The translations won’t start until the Pay and begin translation button has been clicked, regardless of the available balance. If you have recurrent translations, don’t hesitate to contact our support staff to help you make this process smoother. Each time you send us a new batch for translation, simply choose if you want to have the whole batch reviewed by a second professional translator or not. Remember once payment is made, this option cannot be changed. 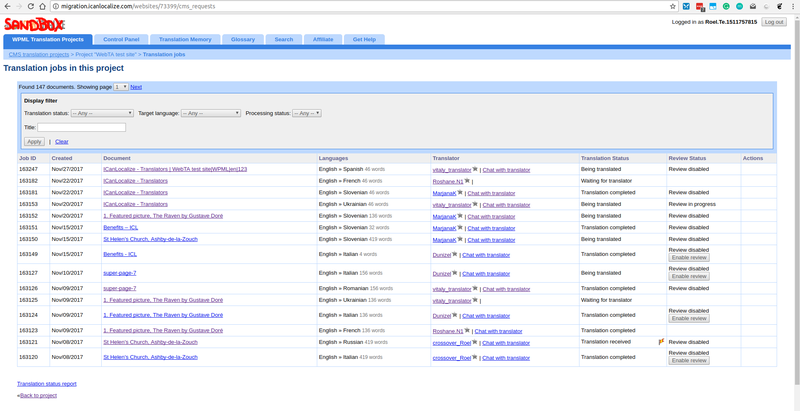 Make sure you have no pending translations for the desired language pair in the Pending Translation Jobs page. In WPML, group the content you want to review and send it in a separate batch. Enable the review service and pay for their translation in the Pending Translation Jobs page. After the payment for the batch to review is confirmed, you can send new content for translation and disable the review for that language pair. After the translators complete the work, you will receive the translated contents directly on your website. You need to select if you want to download the translations automatically or manually. If you prefer to have the translations download automatically, please go to the WPML -> Translation Management page and click the Multilingual Content Setup tab. 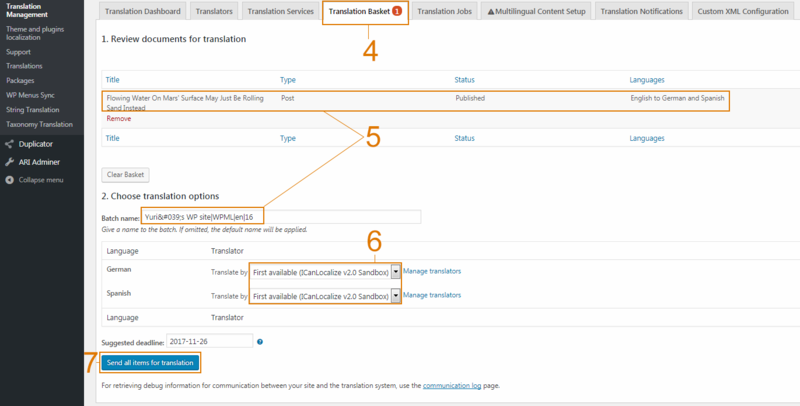 Then, scroll to the Translation Pickup Mode section and make sure you select the Translation Service will deliver translations automatically using XML-RPC option. Regardless of the option selected, you can always click the Check status and get translations in WPML Translation Management Dashboard to download the translations manually. In order to simplify your work, ICanLocalize interface gives you convenient and easy tools to check the progress of your translations, chat with translators and review and your account finances. 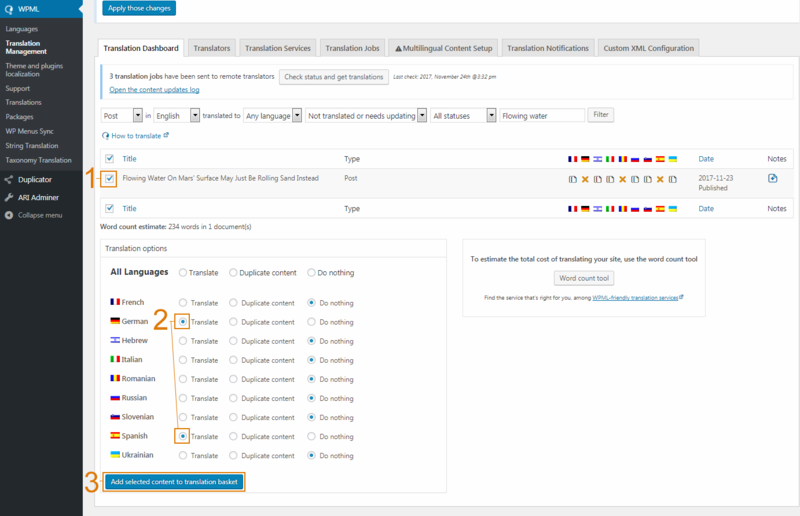 To send updated content for translation, go to the WPML -> Translation Management page, select the modified document and its translation languages, and proceed with the regular translation flow. The Translation Memory will recognize any previously translated parts of the document and the system will consider only the new parts. In your ICanLocalize website project page you will also find the Translation Memory options that will allow you to select when to use it. Regardless of the option selected, you can always click the button Check status and get translations in WPML Translation Management Dashboard to download manually the translations.